We get asked this multiple times each day by people wishing to develop muscle size and strength. In this article I will lay out the cases for and against cardio being the murderer of gains, and you can choose whether to find it guilty or not guilty! Why would cardio prevent muscle gain, and even reverse it? To build muscle you need to be in a caloric surplus, period, unless you are a beginner or coming back from injury (in some cases). Cardio burns calories, which in turn has led to people claiming cardio will stop you building muscle and that it even ‘burns muscle’, because it helps stop you achieving a caloric surplus. These bold and confident claims against cardio are often from very poor sources, such as reality-TV celebs – i.e. Mark Wright, and can be made without evidence, and without thought for the huge fan base who may take this possibly incorrect statement as gospel. They are also often pushed by people with an agenda, aimed at getting you to buy into things you do not require through false statements. To read more on why reality TV stars turned fitness gurus, and the dangers of this, click here. It will increase calories used per day, which can prevent you consistently being in a caloric surplus required for building muscle size and strength (if you do not eat enough). It may hamper recovery, as your physical conditioning and caloric intake may both suffer. For instance you may be too stiff to lift weights because of your cardio or sport, and vice versa. It can prevent you completing 3-5 weights sessions a week and thus lowers total volume (= sets x reps x weight) per muscle group. This will slow the potential muscle growth you could otherwise achieve. It is not essential to complete when building muscle (leading to some coaches and people telling you to avoid it). How can you prevent cardio hampering muscle growth? Eat back the calories burnt from cardio. If this cardio or sport has been in your weekly schedule for a long time (before you started bulking) your body will be used to it, so this isn’t as big an issue. We cover how many calories to eat back in our male and female guides. Ensure you cool down properly after cardio or sport, to flush out the lactic acid and keep you fresh for the coming weights and or sports sessions. Upper and Lower Body stretching routines are also important here. Prioritise your weights sessions, should this be your priority over sport. 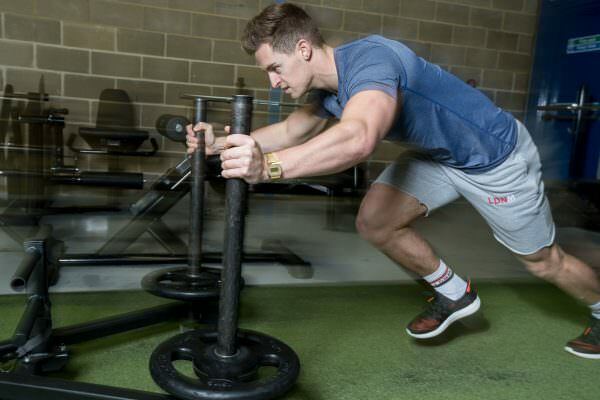 If you are very stretched for time but aiming to build muscle, perhaps switching your cardio for another gym session or simply changing the cardio session to a 10-15 minute HIIT session in the same session as weights would be more advantageous longer term. Cardio can slow your gains in some cases certainly, but this will likely be down to you not eating enough or lifting heavier over time just as much. If you commute to work, have an active job or simply struggle to gain weight, then these are things your body will be used to. You simply need to eat more and more consistently, to start building both muscle size and strength. This is more important for naturally skinnier people, as your body will be used to an active job or commute to work. Essentially, do not demonise cardio, especially if you enjoy it or have an active job/journey to work. As long as you work on keeping up your mobility, flexibility and nutrition, cardio will not kill your gains. Also, do not give up sport you enjoy, as we need exercise to be enjoyable in order for us to want to complete it regularly and long term. On the flipside, do not introduce extra HIIT when you are bulking unnecessarily. One cardio session per week is great for health reasons, but you don’t need to increase them when the goal is muscle gain rather than fat loss.